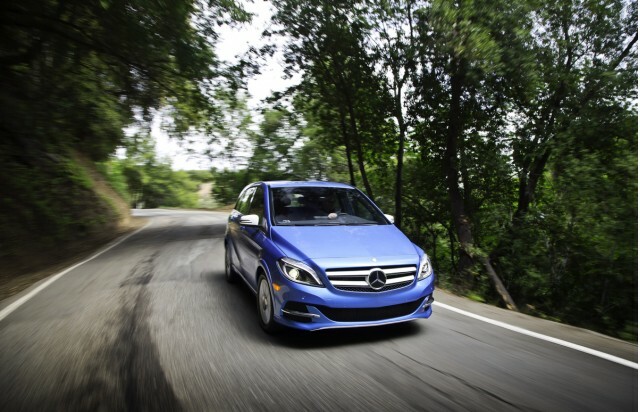 Just over a year after its unveiling at the 2013 New York Auto Show, the 2014 Mercedes-Benz B-Class Electric Drive is getting ready for its U.S. showroom arrival. The compact electric hatchback will go on sale in the U.S. this summer with a base price of $41,450. The Electric Drive is a version of the B-Class hatchback sold in Europe, and is powered by a Tesla Motors-developed electric motor and 28-kilowatt-hour lithium-ion battery pack. The motor develops 132 kilowatts (177 horsepower) and 251 pound-feet of torque, higher than the 100 kW (134 hp) and 228 lb-ft figures Mercedes quoted at the 2013 unveiling. Mercedes says the B-Class Electric Drive will do 0 to 60 mph in 7.9 seconds, and the top speed is limited to 100 mph. Estimated range is 85 miles. A full recharge from a 240-volt Level 2 source takes 3.5 hours, but 60 miles of range can be added after just 2 hours of charging. A sandwich-floor design contains the battery pack, preserving interior and luggage space while keeping the pack low for optimal weight distribution. Befitting its three-pointed-star badge, the B-Class comes relatively well equipped with navigation, the mbrace2 infotainment system, and Active Parking Assist among the standard equipment. However, with options, the average transaction price for this plug-in will likely put it over $50,000--and with a heavy hand on the optional-equipment list, it could reach as high as $56,000. So while Mercedes lists the 2014 BMW i3 (base price $42,275) as the B-Class' main competitor, it could well be cross-shopped against another electric vehicle that features a Tesla-developed powertrain as well: the Toyota RAV4 EV, with a starting price around $50,000. 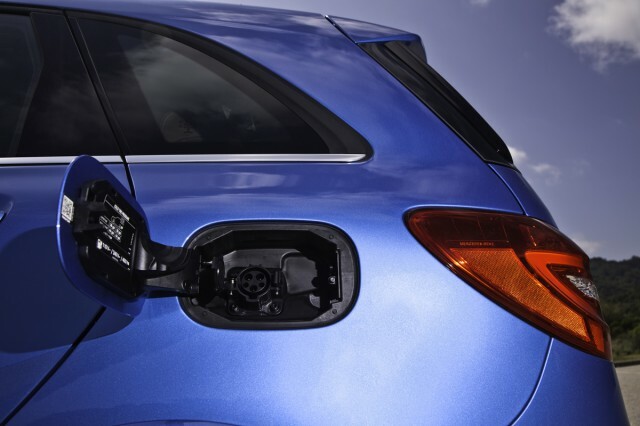 The RAV4 EV is only sold in California, but it offers 103 miles of range compared to the B-Class' 85 miles, and more space. The B-Class will be easier to find, but only slightly. It will reportedly be offered initially only in a handful of states--California, Connecticut, Maryland, New Jersey, New York, Oregon, Rhode Island, and Vermont--before a planned nationwide rollout in 2015. It also seems likely be sold in small numbers, similar to those of the "compliance cars" offered only to keep automakers in line with the California zero-emission vehicle mandate. For more on the B-Class Electric Drive, see this first drive preview from Robert Scoble (via Inside EVs).